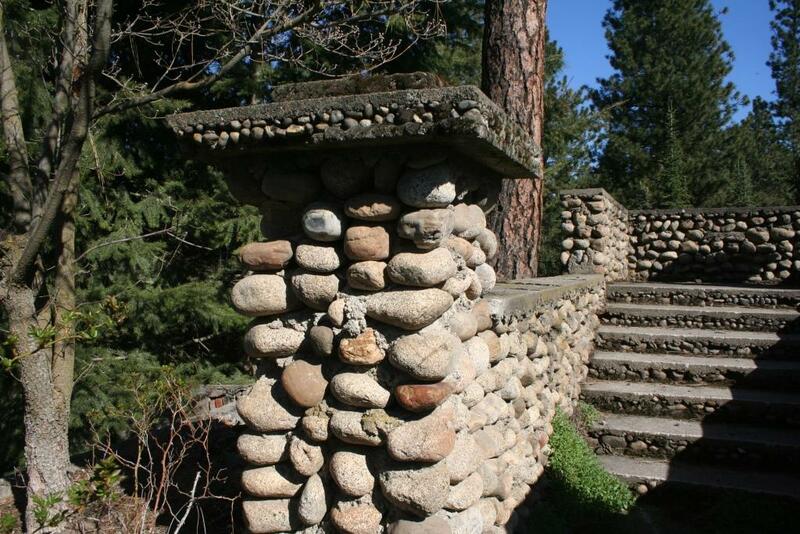 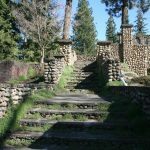 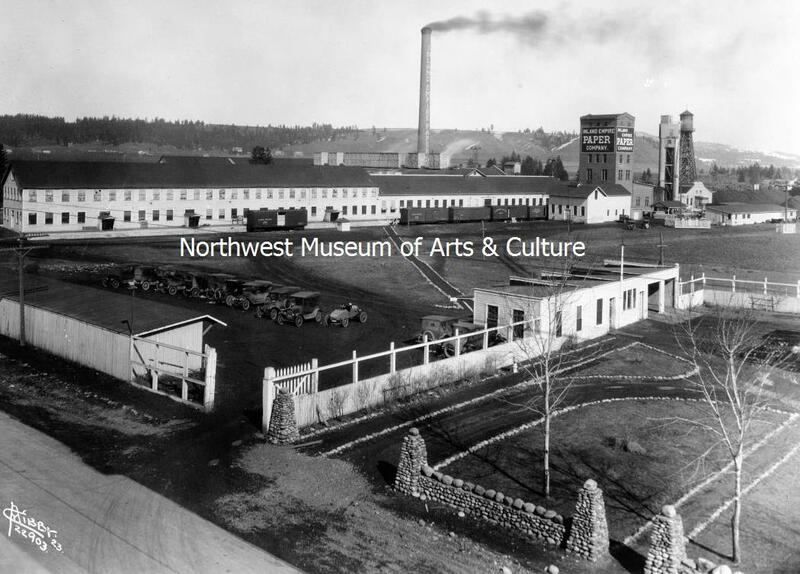 Rounded and shaped by long ago flood waters, cobblestones deposited in the soil of Spokane County provided creative residents with large amounts of building material in the early years of the 20th century. 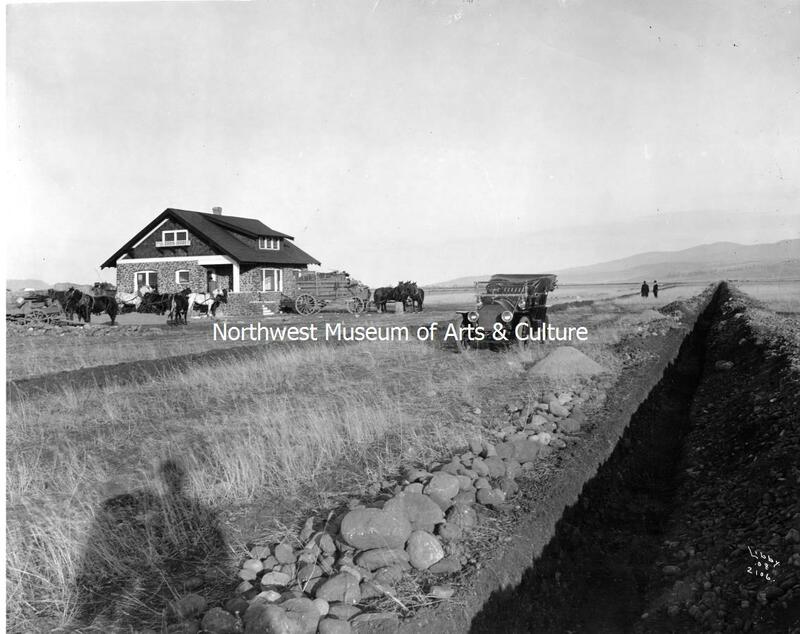 As the farming culture of Spokane Valley expanded, the need for irrigation did as well. 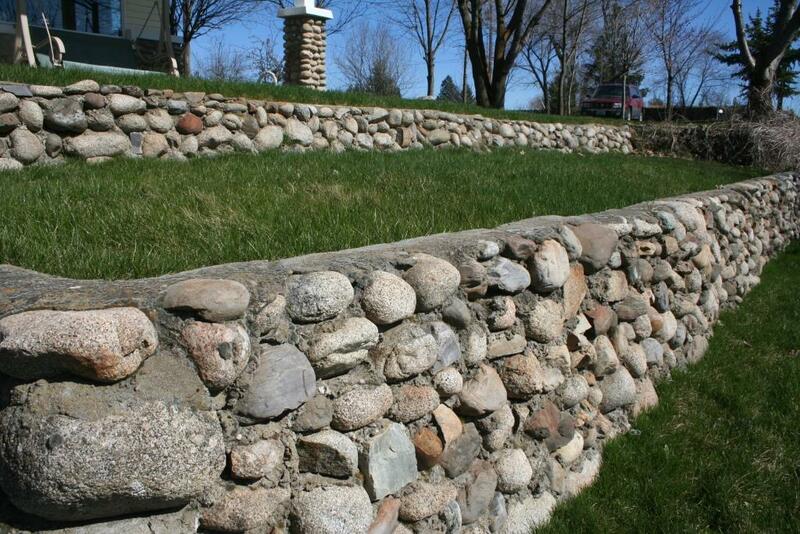 The process of disrupting the soil to bury pipes for irrigation exposed large numbers of these rounded stones. 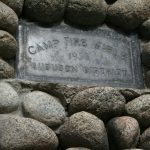 The cobblestones, often granite in nature, were collected from the sides of trenches and piles of overturned dirt and were utilized as both decoration and as construction material. 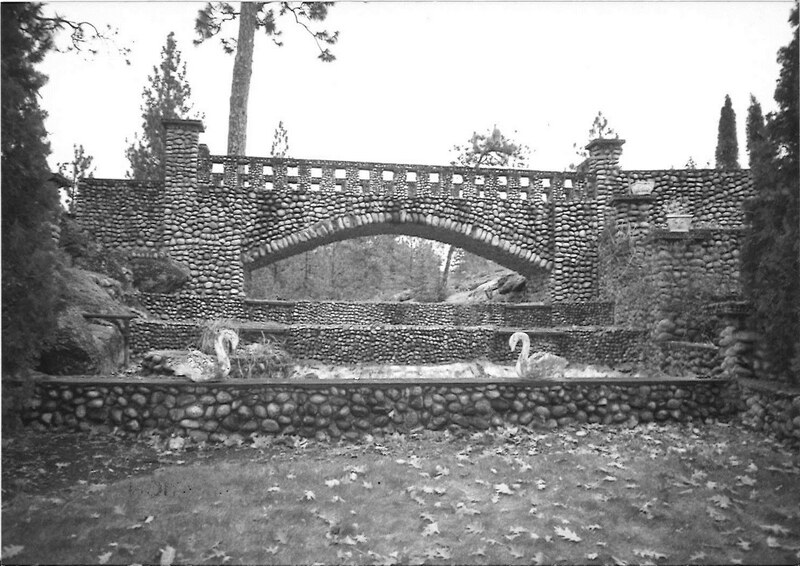 Homes, walls, bridges and other various buildings were created using uniformly rounded stones creating extremely recognizable and unique structures throughout the county. 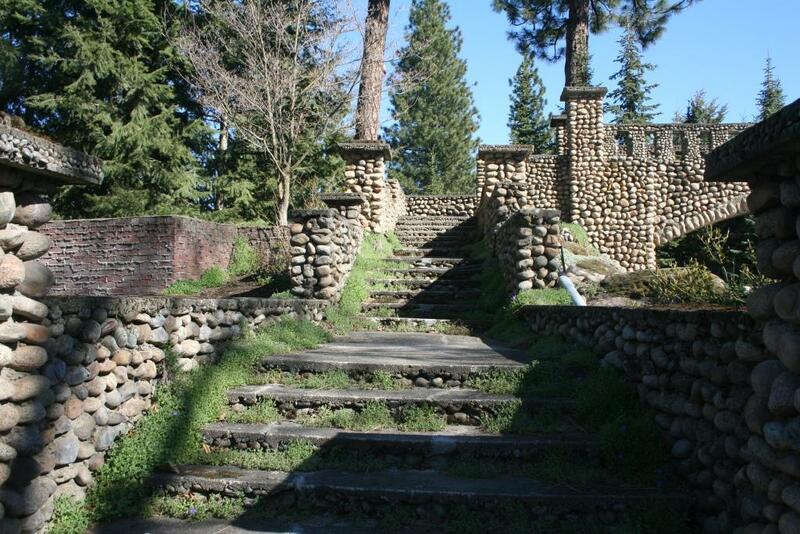 Cobblestones skillfully selected, assembled and mortared together were used to create extensive and intricate structures that remain today as works of art created by the craftsman of years gone by. 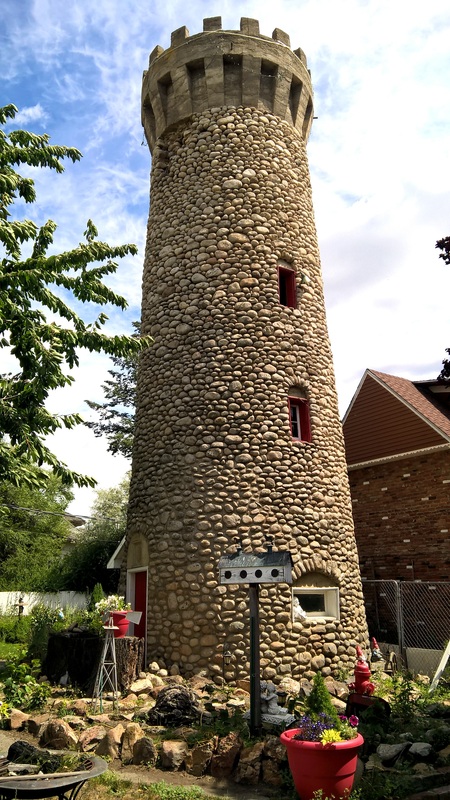 This recognizable tower, and the connected wing, have stood since 1906 when it was built by the new Vera Electric Water Company. 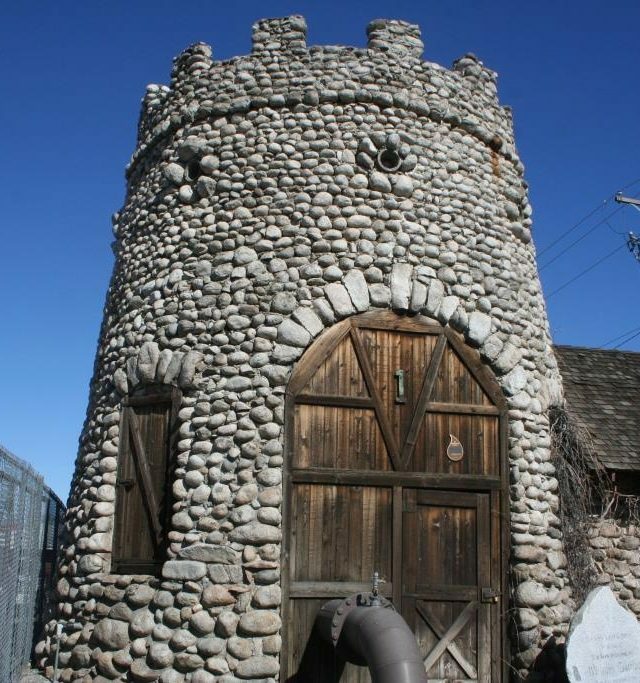 The structure is built of cobblestones and features a large wooden plank door used to access the pump equipment located inside. 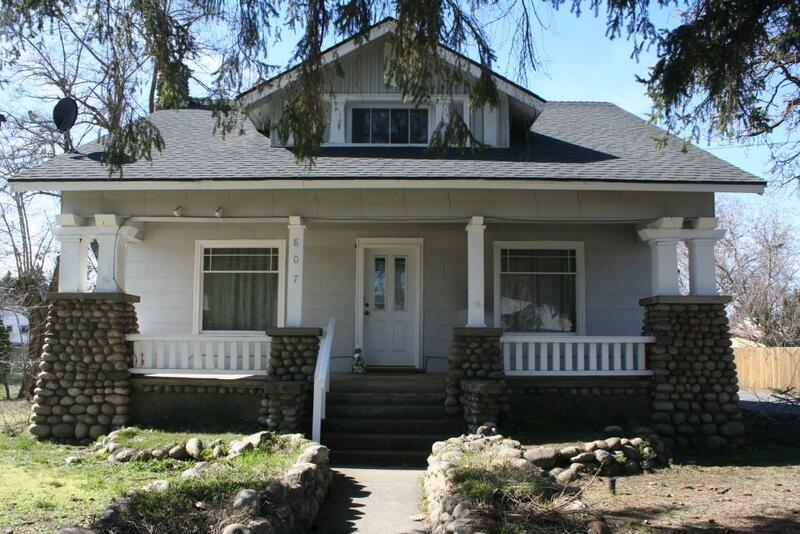 The attached wing was most likely an office or residence for the superintendent charged with maintaining the pump. 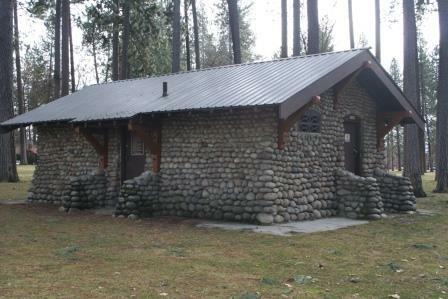 The water supplied for the support of agriculture in the county as well as the unique construction material and style make the Vera pump house an important part of local history. 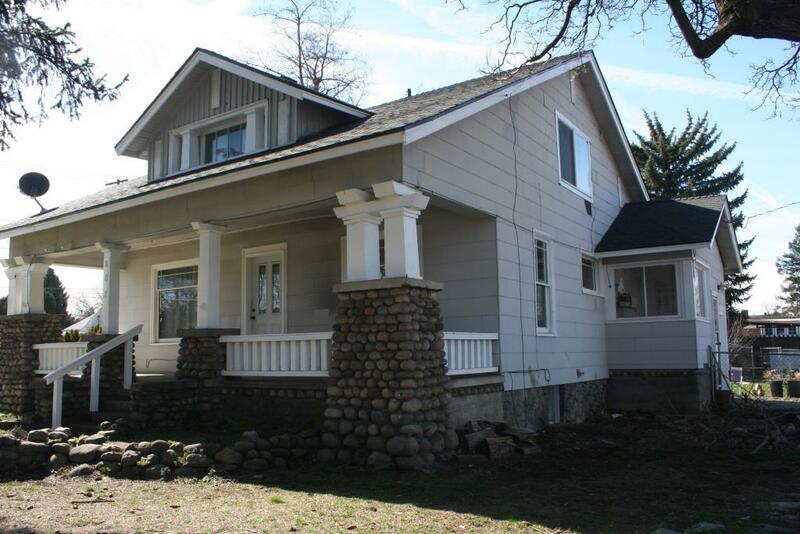 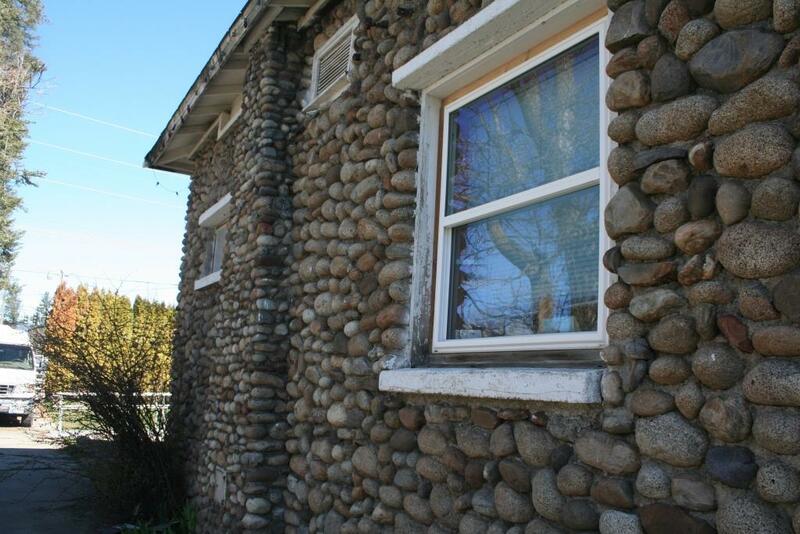 Built in 1915, this home features granite cobblestones as a key part of the exterior design. 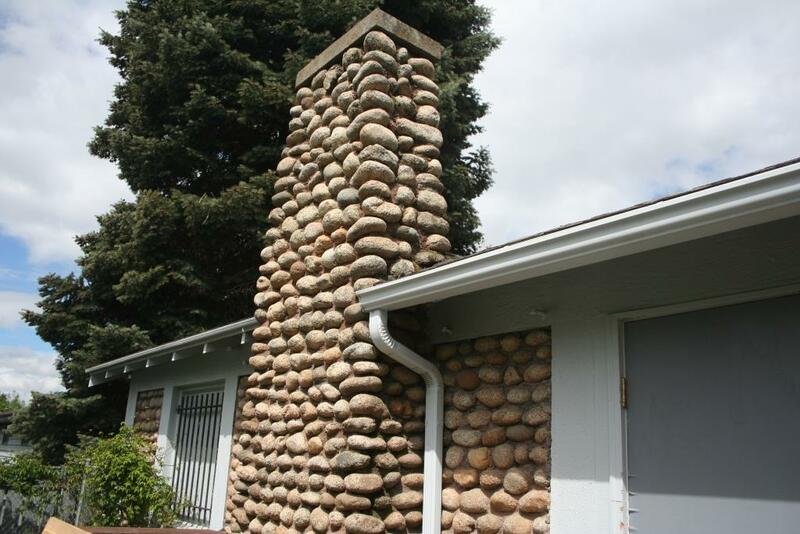 A large cobblestone chimney sits on the south side of the home and is one of the most noticeable uses of stone around the home. 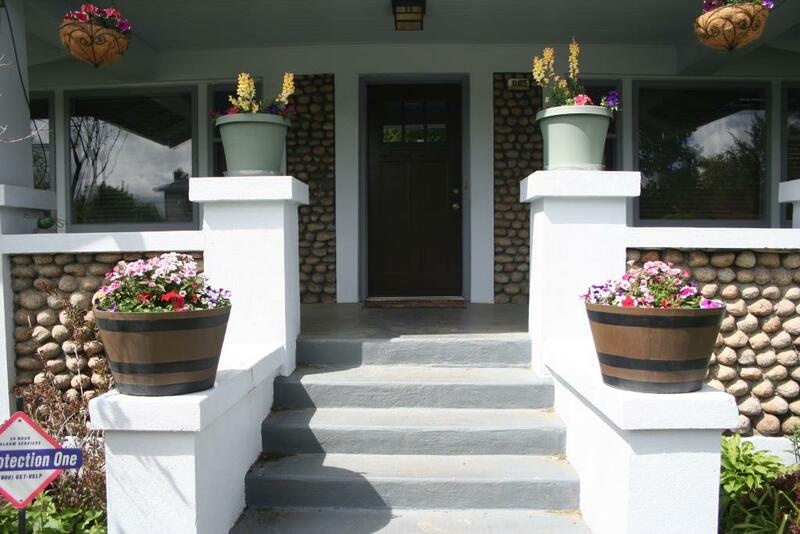 The front porch is anchored by square piers made of cobblestones that flank the front entrance and contrast with the wooden posts they support. 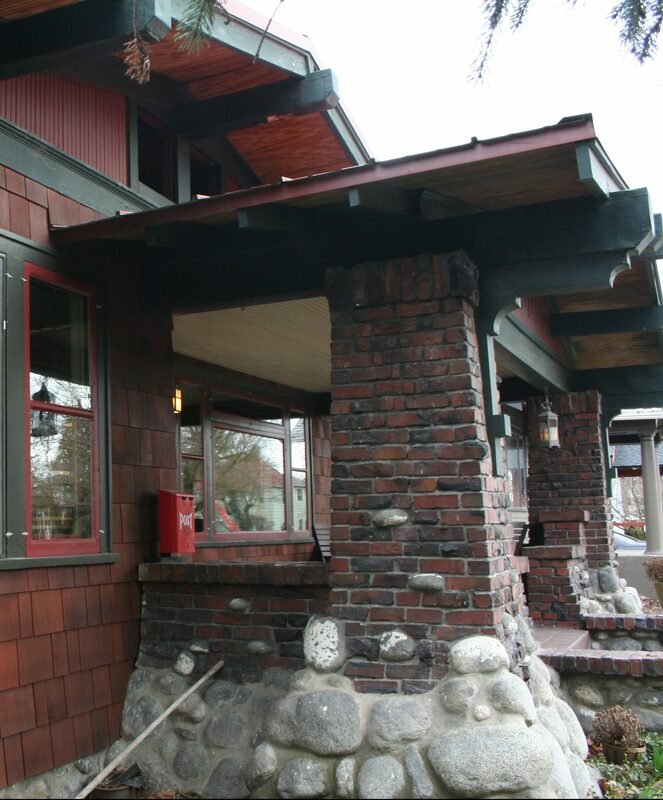 Although the cobblestones are all still intact and maintain the original appearance of the home, changes such as new windows and replacement of the exterior covering of the home prevent this house from being considered an intact example of early Craftsman architecture. 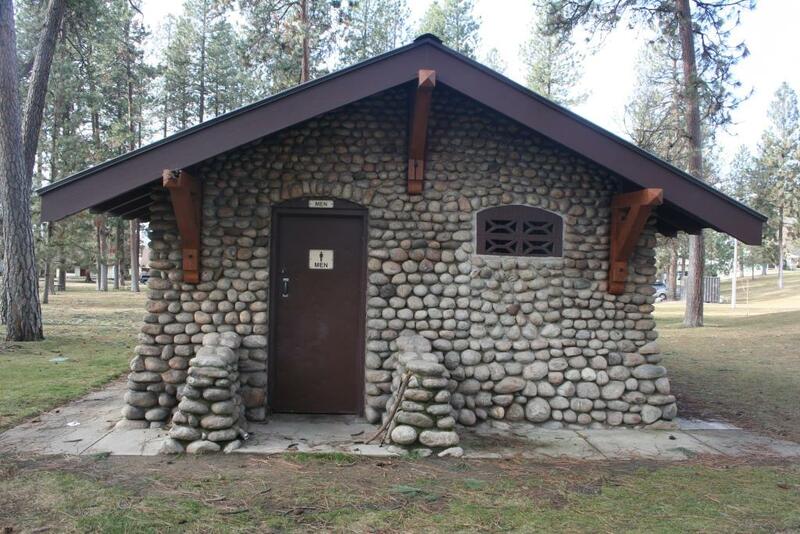 Exhibiting a rustic appearance similar to many of the other park buildings in the Spokane area, the Audubon Park restroom was constructed in 1920. 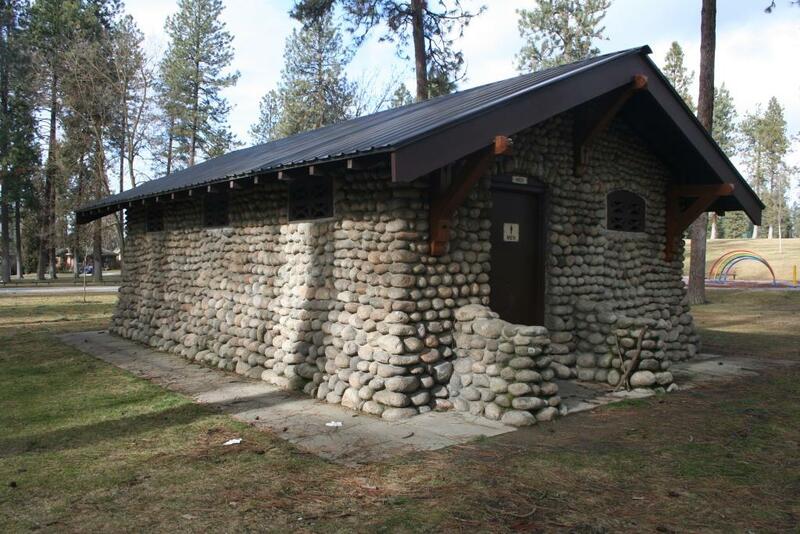 The cobblestone construction of this particular structure sets it apart from other stone restrooms built of basalt rubble. 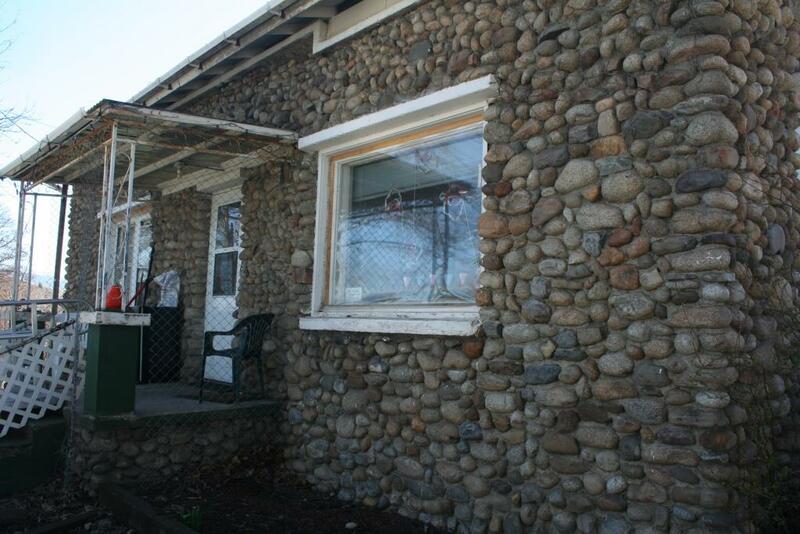 Over time, cobbles have been replaced using poor craftsmanship making any repairs very noticeable. 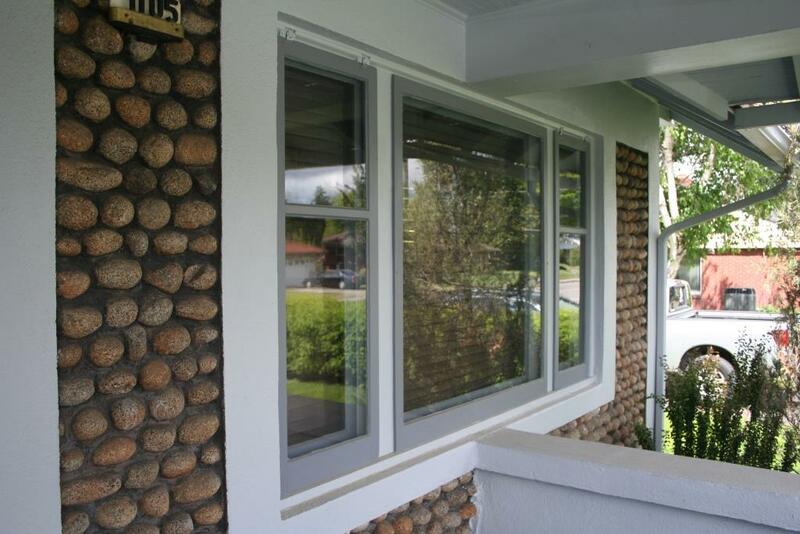 Visually, the building remains similar to its original appearance with the most noticeable change occurring to the window openings which have been minimized with the addition of cinder blocks to increase the security of the building. 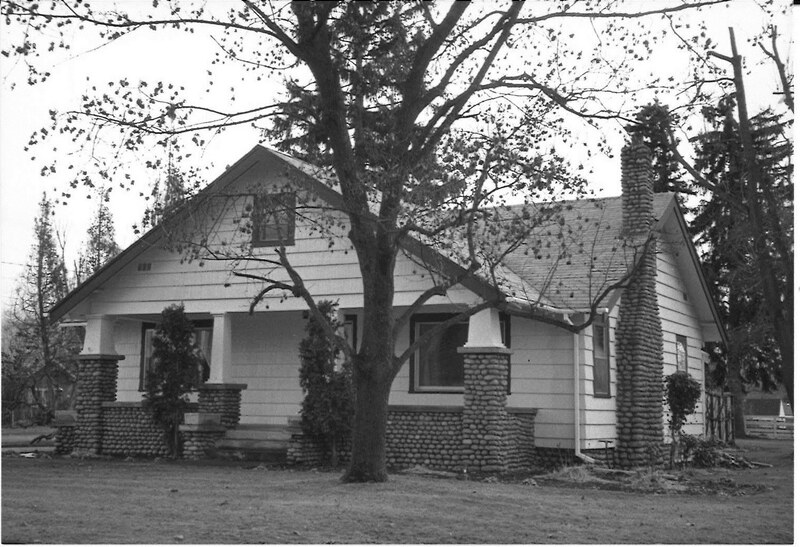 Located on Valleyway Avenue, the exterior of this two story house is constructed of granite cobblestones of irregular sizes. 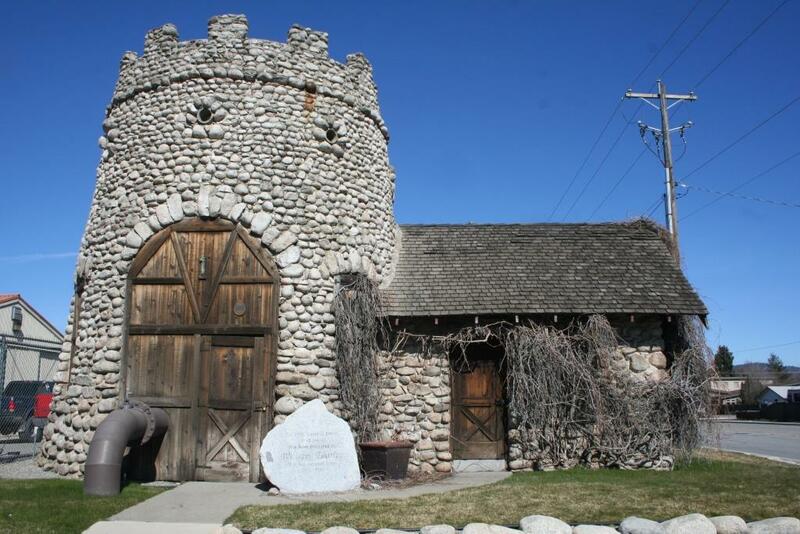 Built in 1909, it is one of the oldest native stone buildings in Spokane Valley. 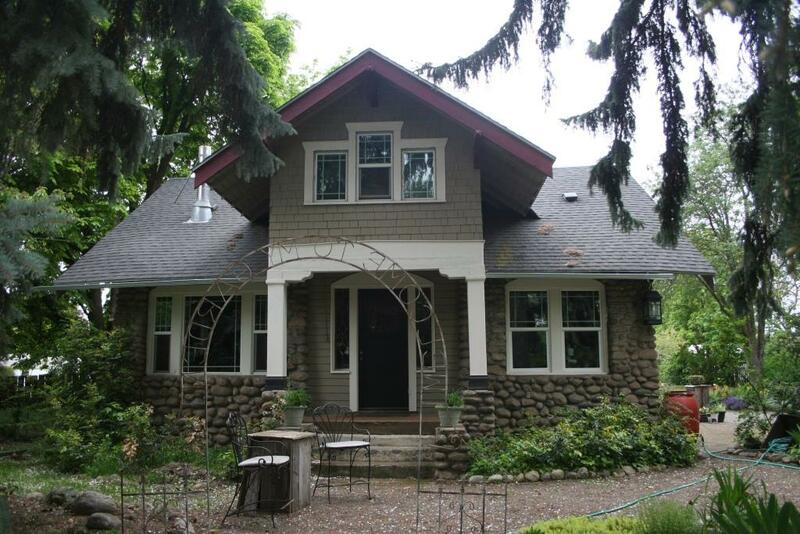 Stone is used on the entirety of the lower floor of the home while the multiple gables are covered in shingles rather than cobblestones. 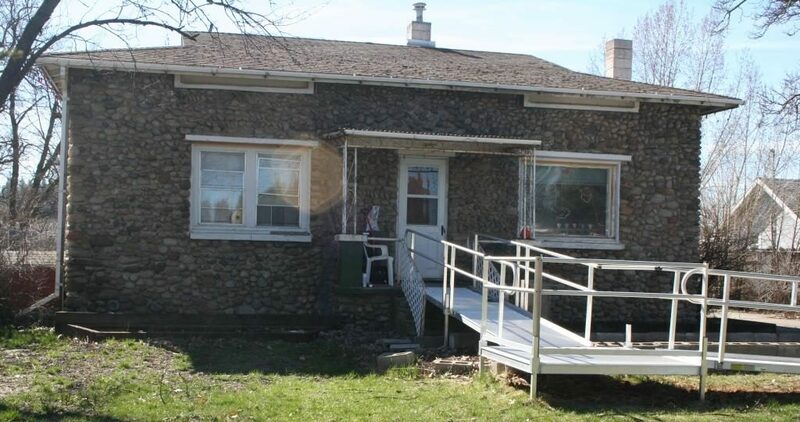 The home eventually fell into disrepair and by the 1990s and required a vast amount of work. 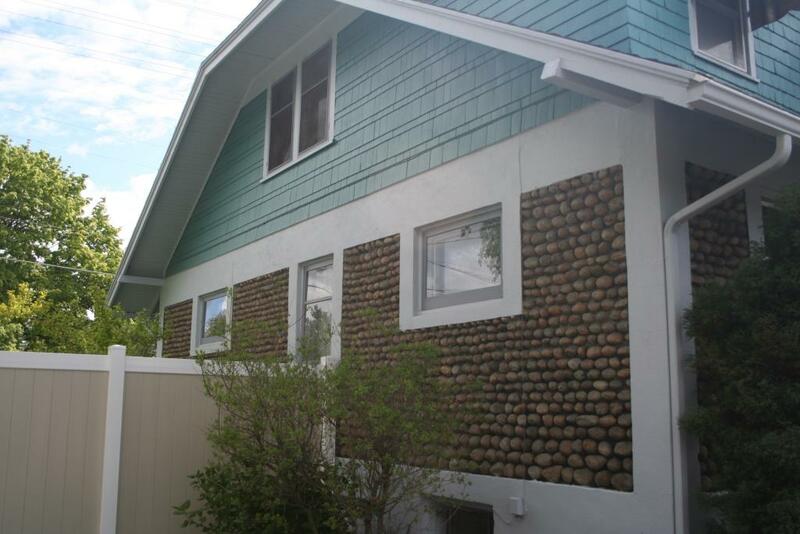 The rehabilitation work maintained the historic accuracy of the design and the house remains an outstanding example of cobblestone craftsmanship. 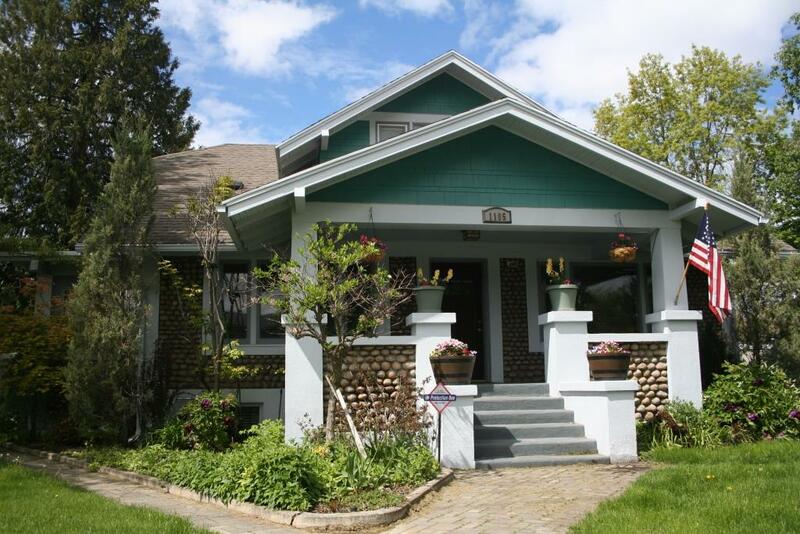 A simply designed house built in 1925, the facade is the identifying feature of this building. 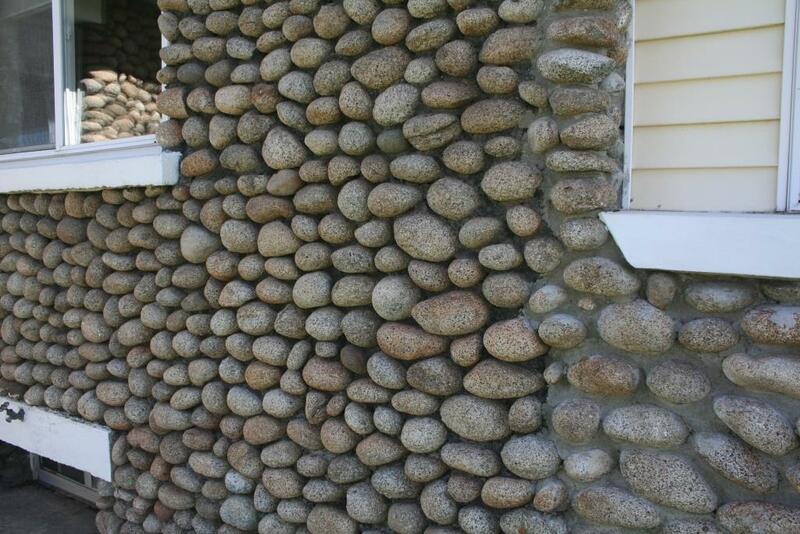 Though these granite cobblestones required a vast amount of work to collect and assemble, the level of skill utilized in the construction of this home is not a high as many other native stone structures. 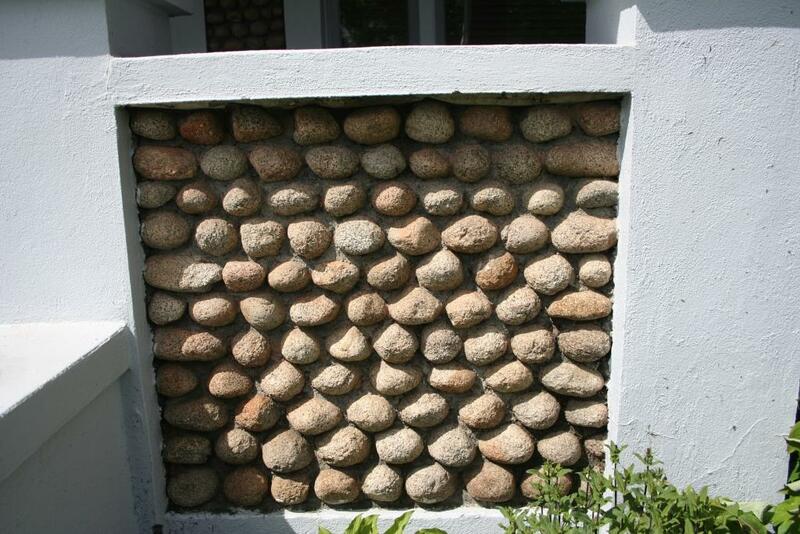 The varying sizes and quality of stones, as well as the visibility of mortar in some locations, are both indicators of less than expert craftsmanship. 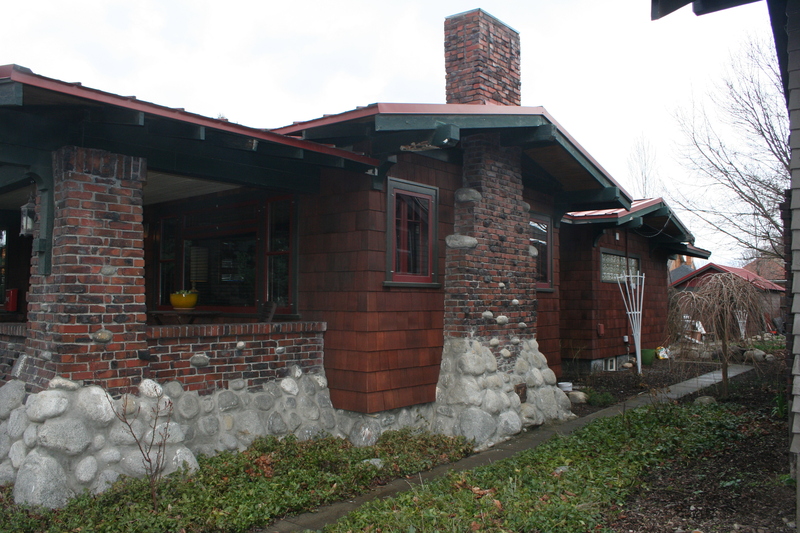 The current roof design of the home is not the original appearance though it does not detract from the stone work of the home. 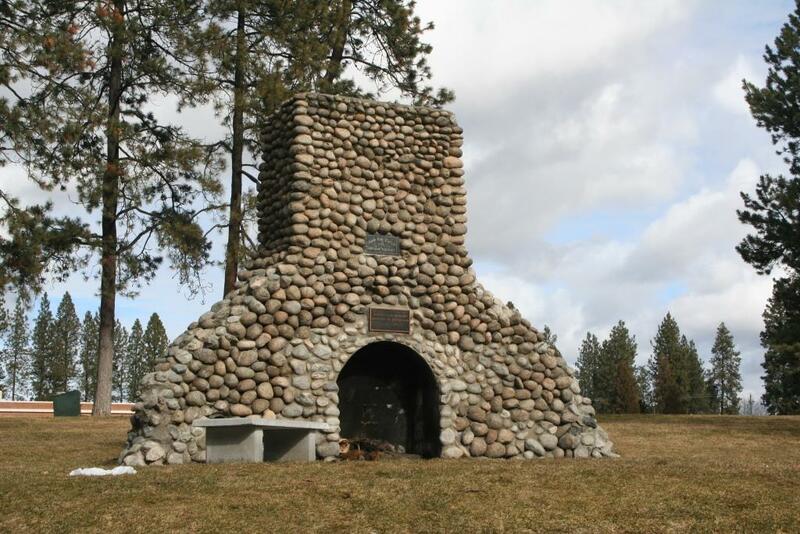 At twelve feet tall, this towering cobblestone fireplace is a prominent feature located in the center of Audubon Park. 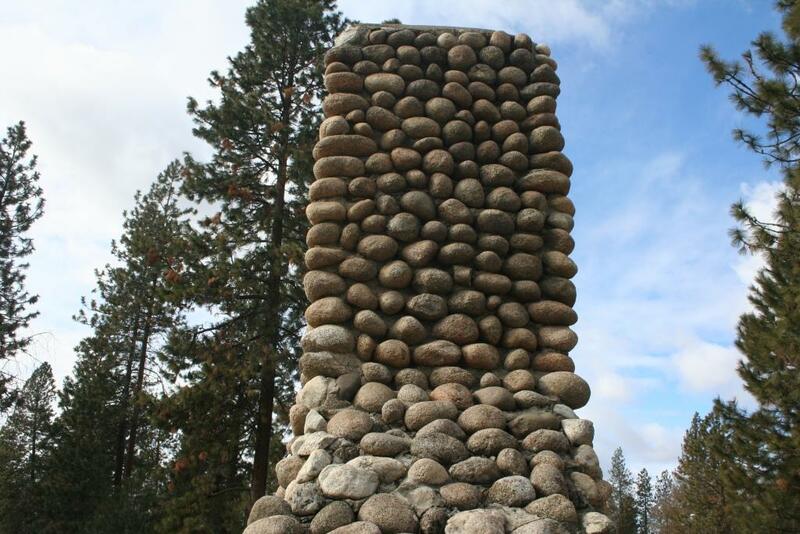 The stones are stacked with little mortar showing, creating the appearance of a carefully balanced tower of rock. 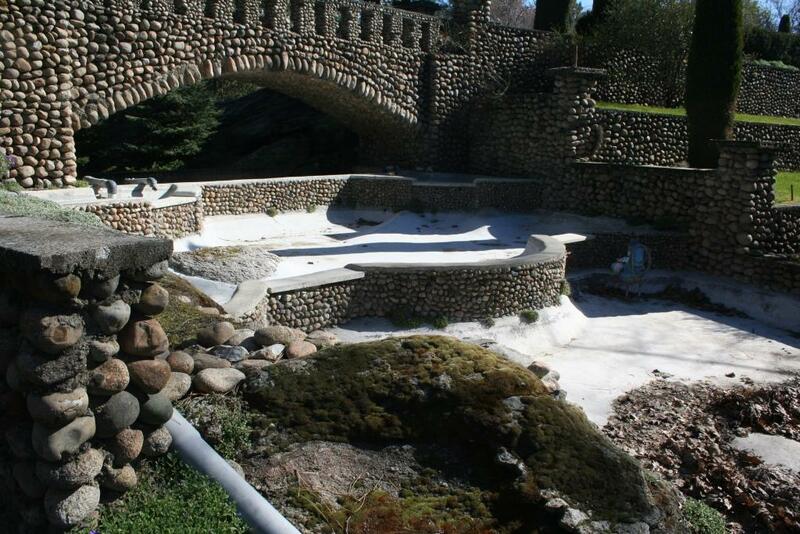 The uniform granite cobbles are a decorative veneer surrounding a stone and concrete core. 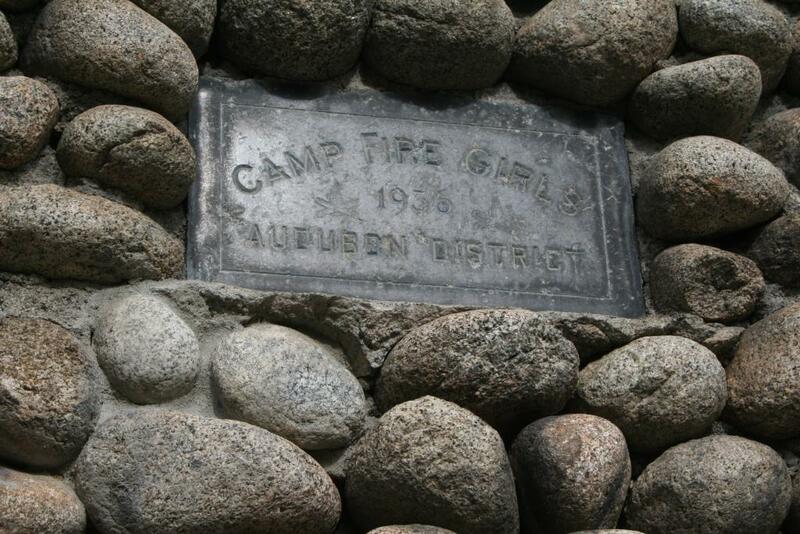 Money for the construction of the fireplace in 1936 was raised by a local group of Camp Fire Girls, a feat acknowledged by a plaque embedded in the surface of the chimney. 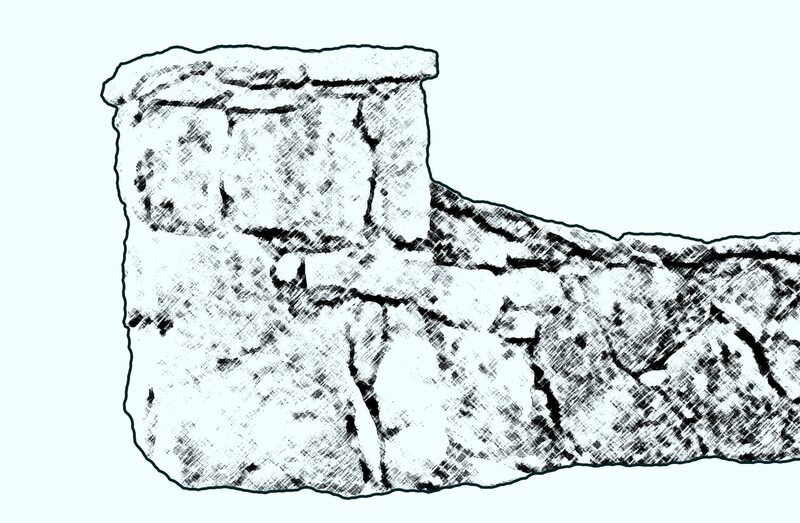 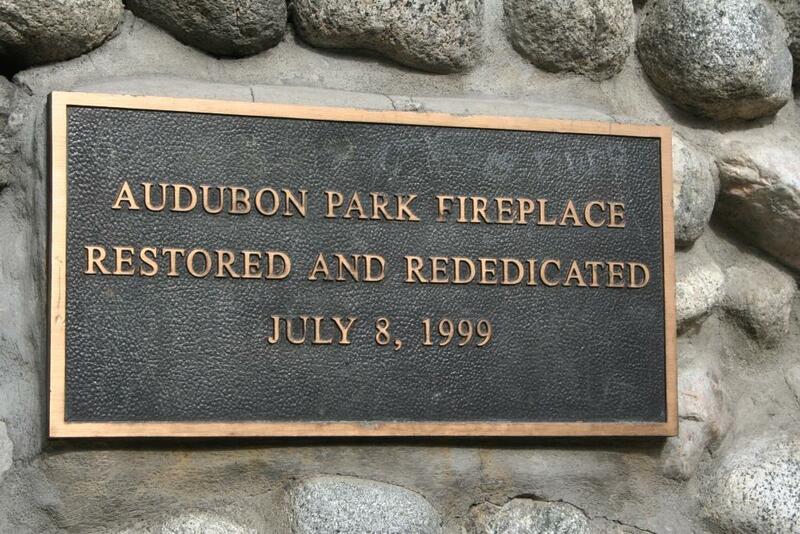 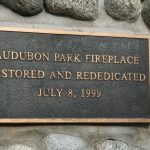 Repairs, undertaken in 1999 by the Spokane Parks and Recreation Department and the Northwest Neighborhoods Council, can be seen on the lower edges of the fireplace. 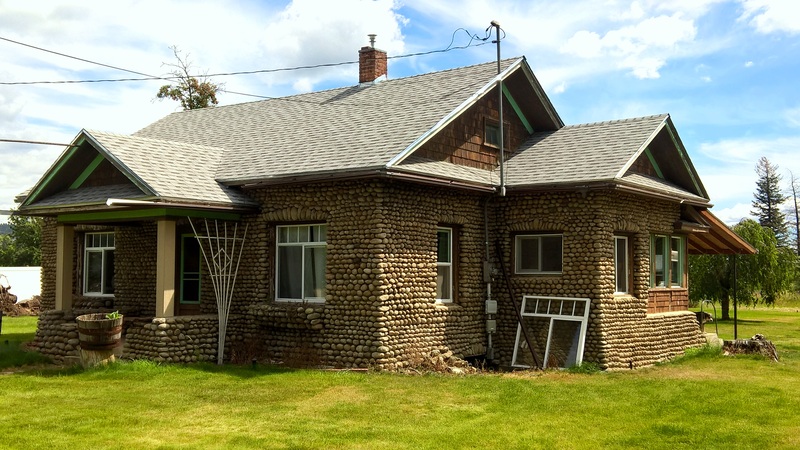 The exposed cobblestone foundation that surrounds this 1904 home is perhaps the most noticeable feature of the building. 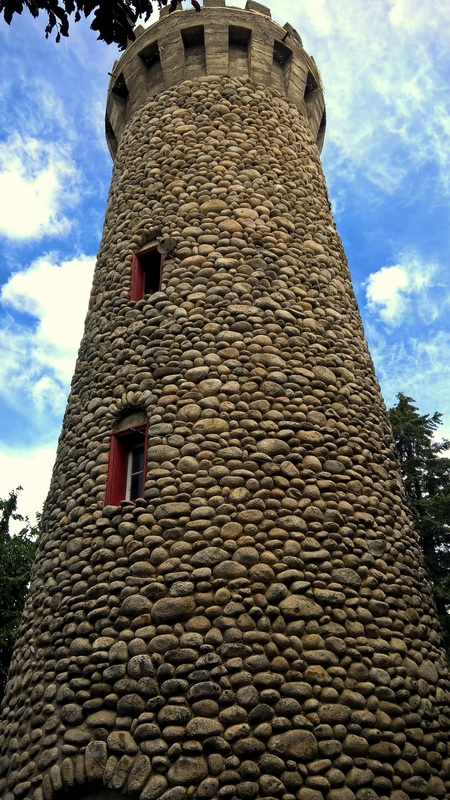 The unusually tall foundation exposes a large amount of the mortared cobblestones utilized in construction. 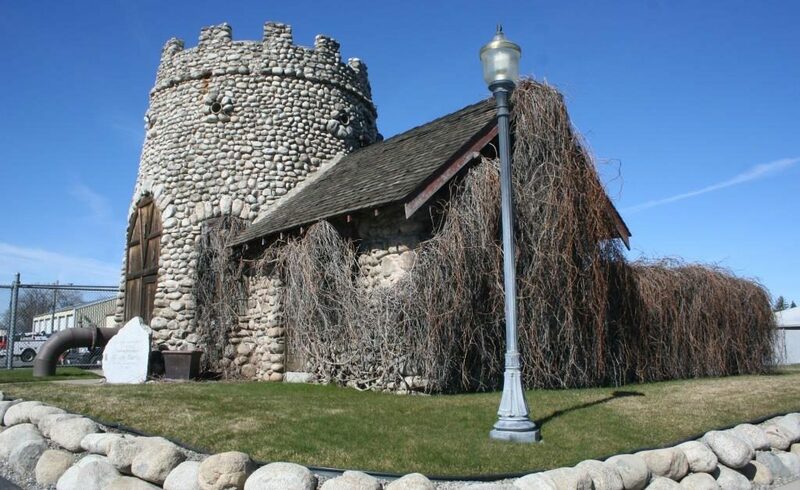 The cobblestone base continues to the front porch with strong half walls supporting the round posts that stand beneath the edge of the large gable. 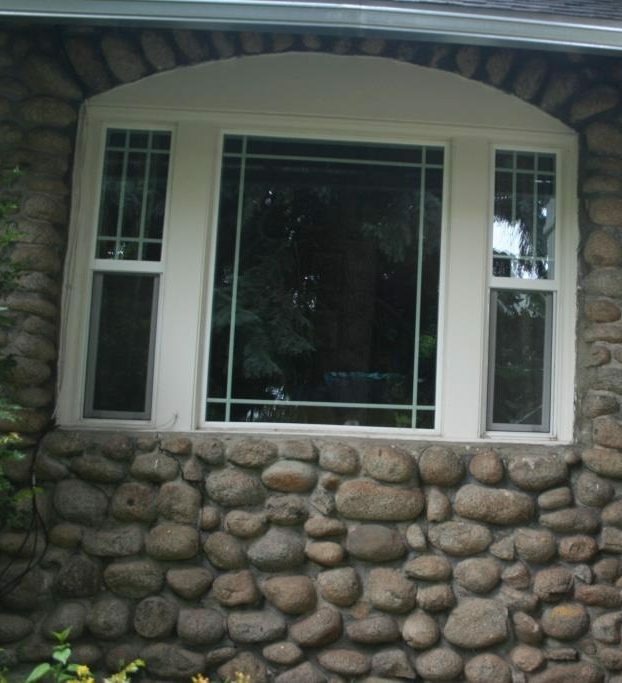 Changes to the windows of the home prevent the house from being eligible for listing on the National Register of Historic Places but it remains an interesting example of cobblestone construction. 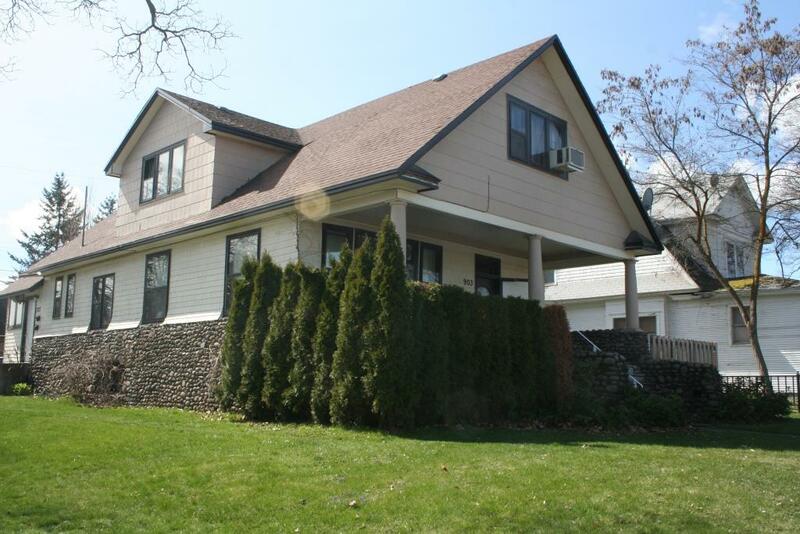 The exterior of this home on Broadway Avenue is a mixture of granite cobblestone construction and vinyl siding. 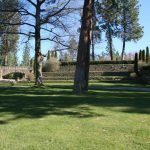 The use of cobblestones extends to the landscaping of the property, specifically in the walls dividing the tiered lawn on the south side of the home. 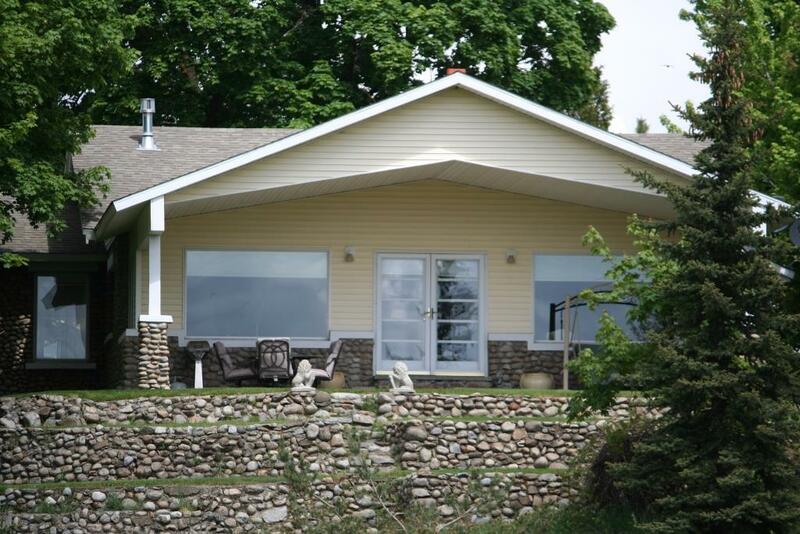 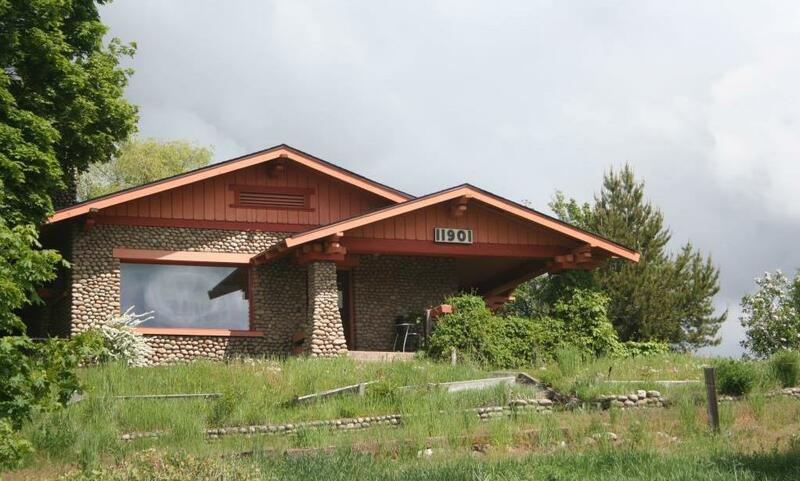 Constructed in 1920, there is no identifiable style attached to this home beyond the use of locally collected stones. 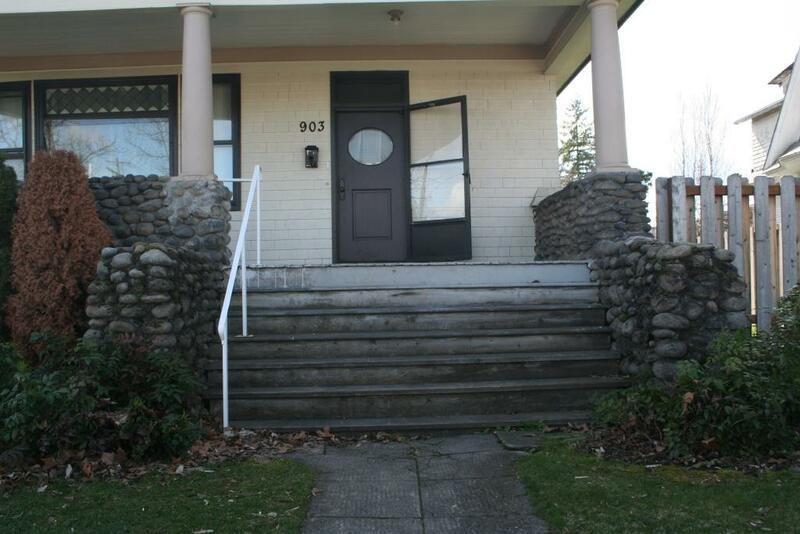 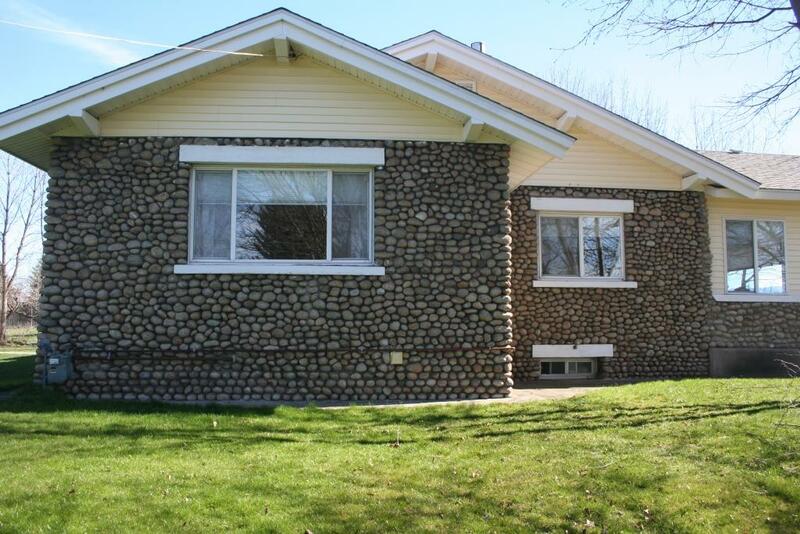 The granite stones featured on the property make this home an important piece of Spokane Valley history and an excellent example of the possibilities cobblestone construction provides. 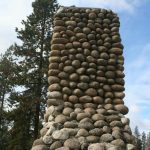 Located along one of the main routes used to travel from Fort Walla Walla to Fort Benton in Montana, this marker is one of multiple similar monuments located throughout the county. 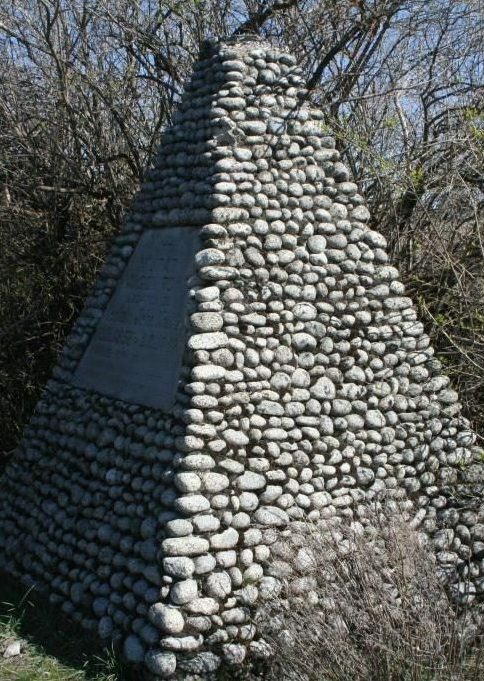 This pyramid of cobblestones was constructed in 1922 and includes an inscribed panel detailing its purpose. 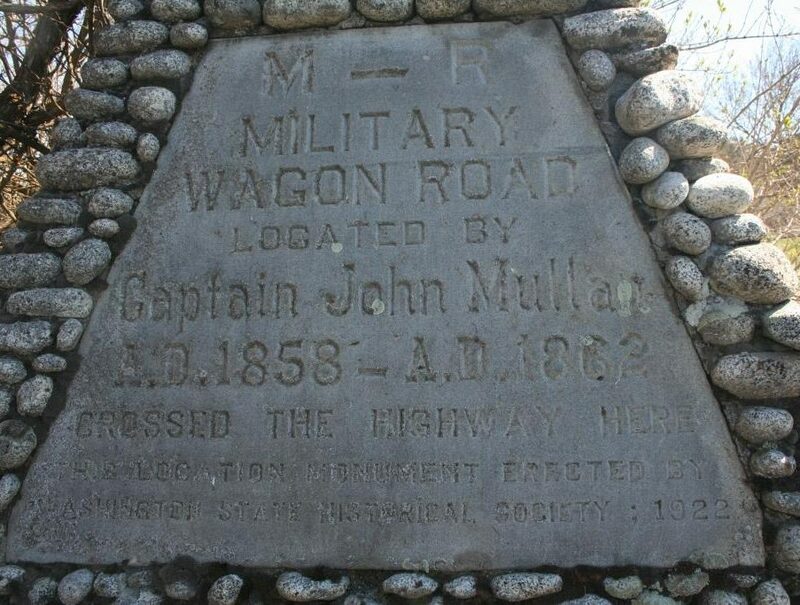 Evidence of the original road used by wagons in the early years of settlement in eastern Washington has long since disappeared with only the stone markers left to identify the path traveled by Captain Mullan and his men. 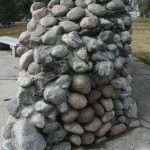 The carefully placed stones are held in place by mortar despite the dry stacked appearance and have withstood both the elements and time and remain a tribute to the history of the region. 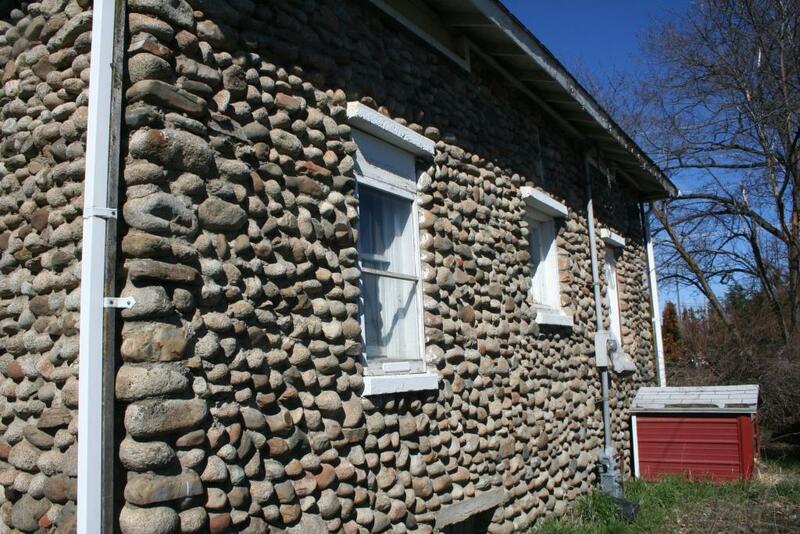 The cobblestone house on Bowdish Avenue is one of the finest examples of stone workmanship in the county. 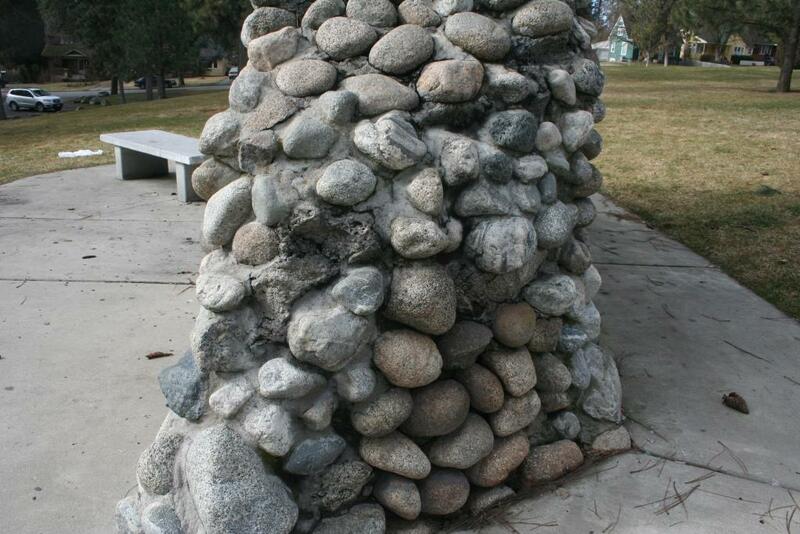 All of the stones used at this location are identified as granite and are extremely similar in size suggesting a great attention to detail was used during construction. 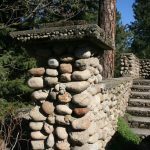 The stone work is located only on the lower story of the building but cobblestones are included on every exterior wall including the half walls that define the home’s front porch. 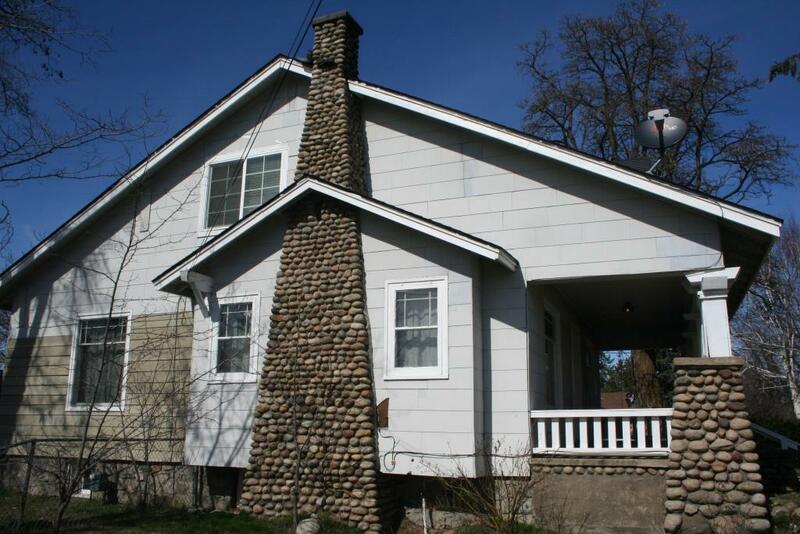 The chimney on the south side of the garage, located behind the home, is constructed entirely of cobblestones and is an additional defining feature of the heavily stone accented home. 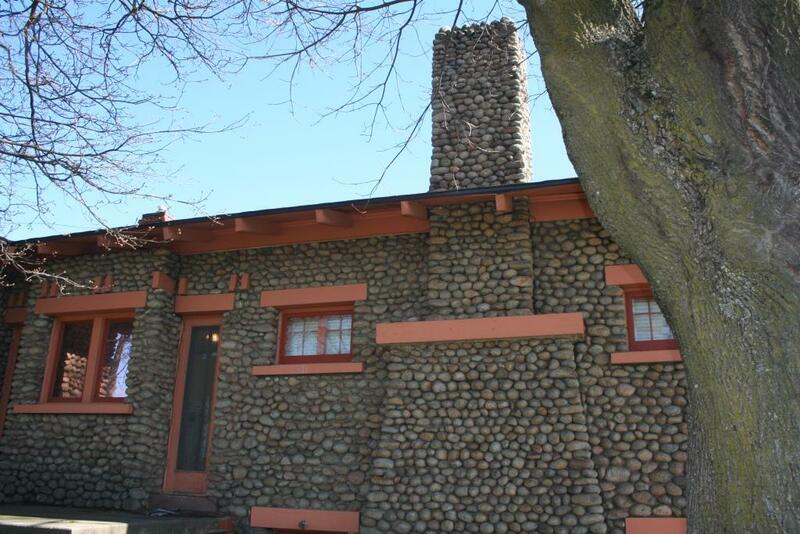 Built by Norwegian immigrant Einar Fieldstad in the 1920s, this cobblestone home maintains some of the most detailed craftsmanship as well as the most extensive history of any of the stone houses in the county. 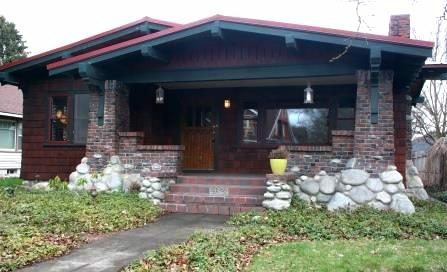 Featuring wide eaves, a large wrap around porch and prominent cobblestones, this home is an interesting combination of traditional and distinctive characteristics. 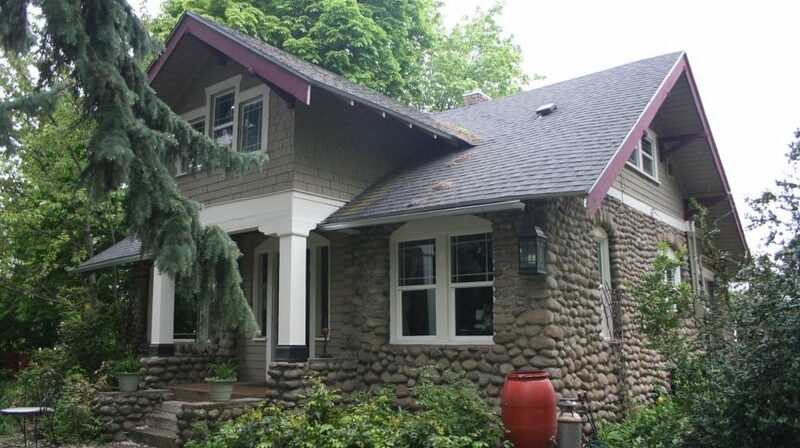 The large stone piers supporting the front porch and chimney on the exterior of the home both utilize granite cobblestones, increasing the rustic appearance. 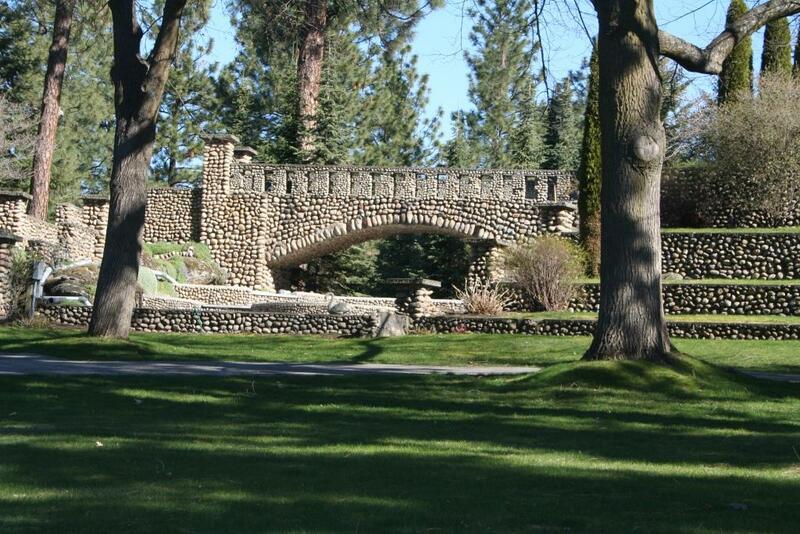 One of the most elaborate cobblestone houses in Spokane Valley, it has continued to stand atop a low hill in the heart of Spokane Valley since its construction in 1918. 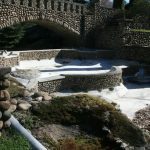 Consisting of retaining walls, ponds, bridges, stairs, and more, the property of Blakely Gardens is an extensive and detailed example of cobblestone construction. 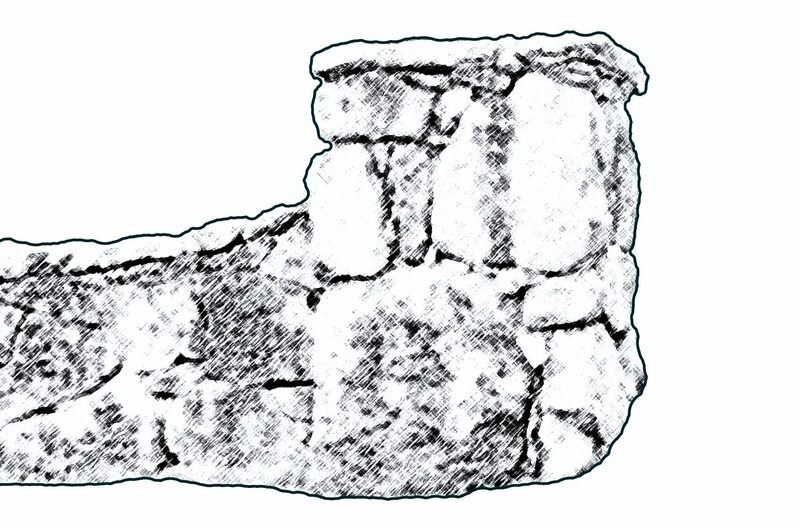 Mortar holding the stones together is rarely visible and very few repairs have been needed since the time of construction in 1930, suggesting a high level of workmanship. 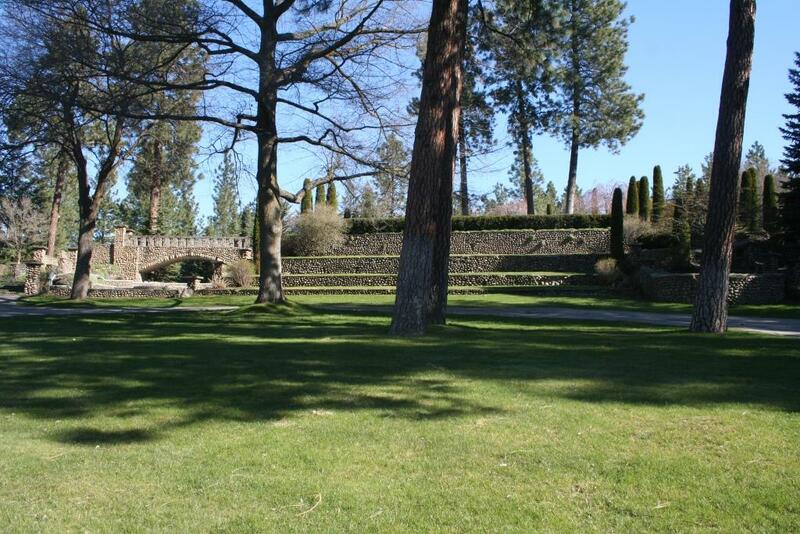 The property and gardens were originally owned by Henry M. Blakely, a prominent businessman in Spokane. 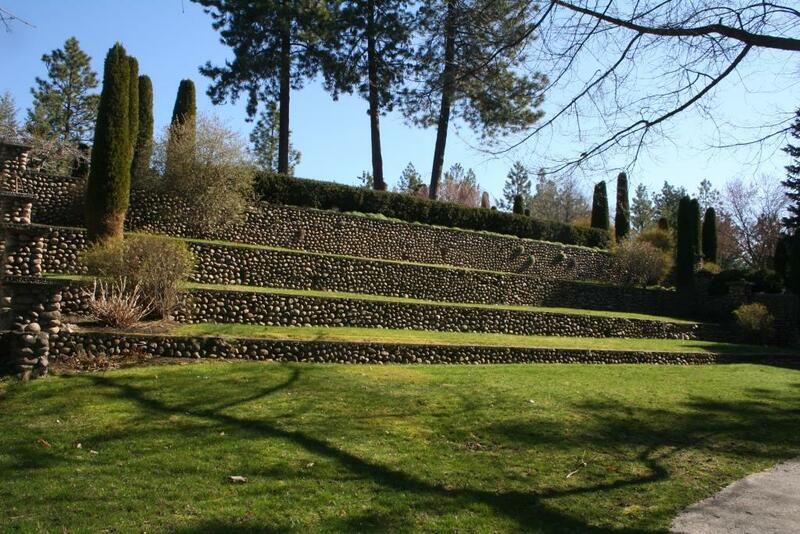 Now, multiple modern homes reside on the nearby property and the gardens are privately owned and closed to the public. 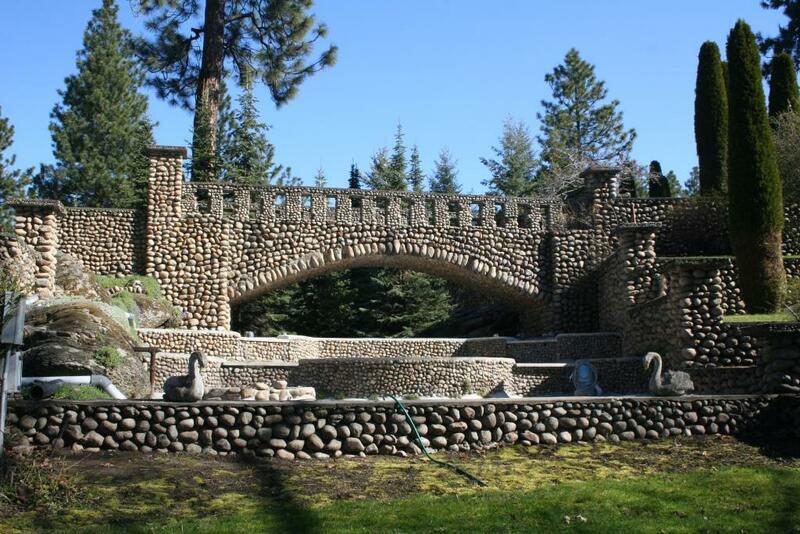 This stone masterpiece remains as an intact work of art and is one of the most impressive uses of cobblestones in the county. 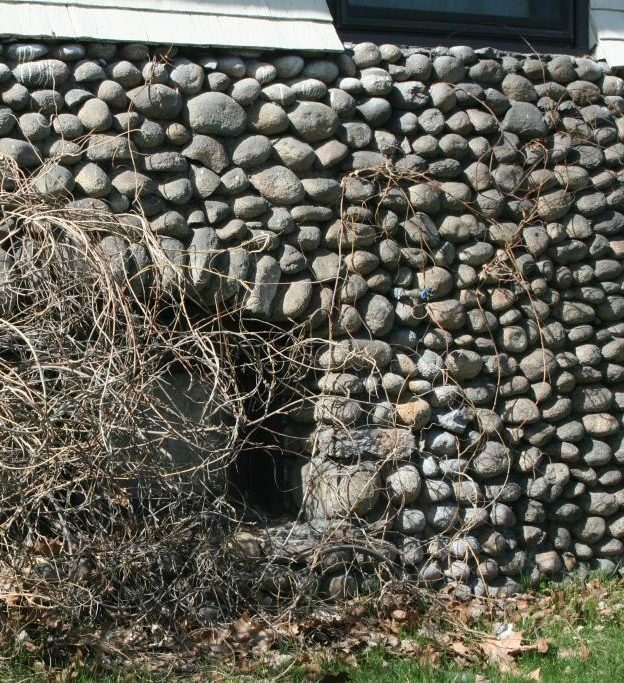 Bordering a portion of Rutter Parkway, the Glen Tana Farm stone walls are an example of cobblestone architecture intended more for function rather than decoration. 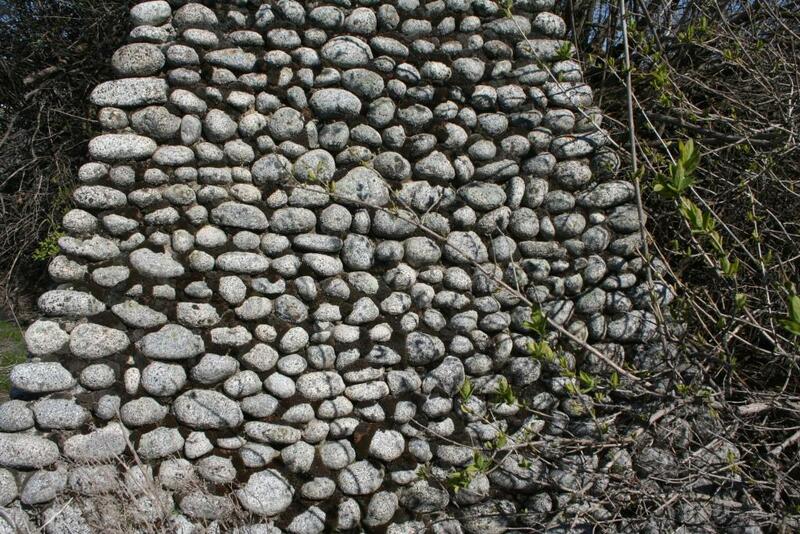 The varying sizes of stones and sloppily applied mortar make these walls one of the lowest quality examples of native stone construction. 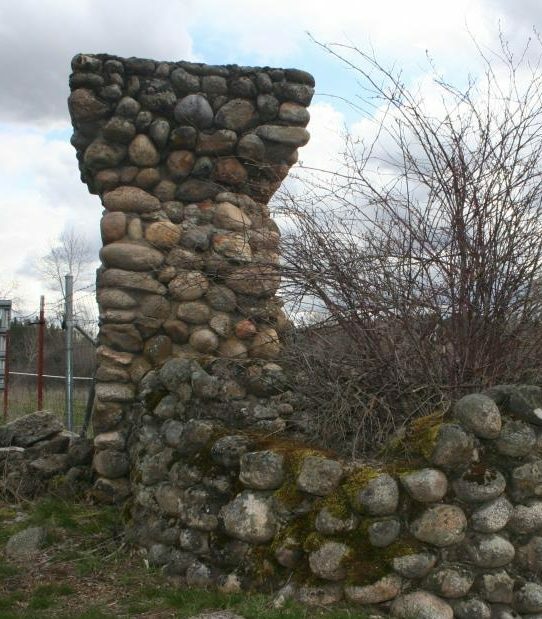 Built around the turn of the century, the walls border a piece of property that once operated as a working farm with a dairy operation and dog kennels. 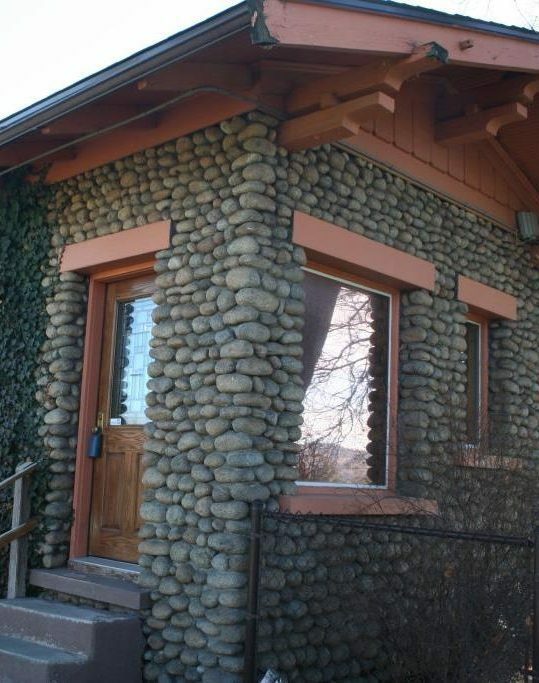 The home at Glen Tana also features cobblestone elements creating a continuous rustic feel across the property.